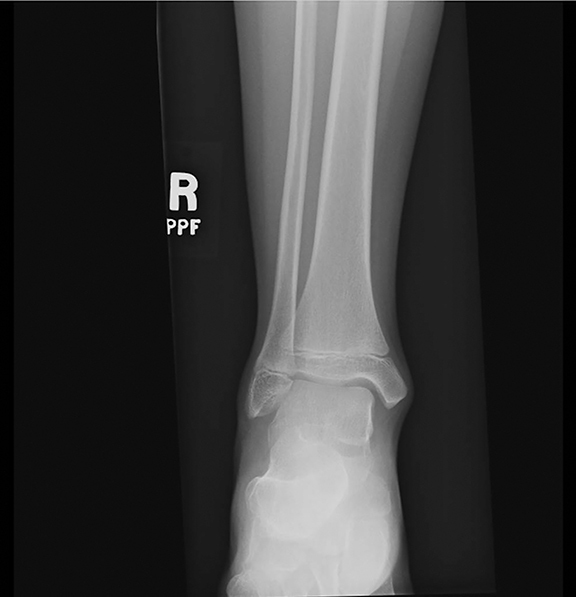 A 10-year-old girl presented to her pediatrician complaining of intermittent lateral ankle pain for several weeks. There was no history of trauma. The patient was otherwise healthy, with no other pertinent medical history. Physical exam, routine labs and vital signs were normal. An ankle X-ray was ordered and read as normal. The patient was treated conservatively for what her doctor thought may be a bone bruise or sprain injury. Over the course of the next several weeks the patient continued to complain of intermittent ankle pain. Eventually, the patient returned to the pediatrician, at which point the pediatrician ordered an MRI of the ankle. The initial X-rays were read as being normal. 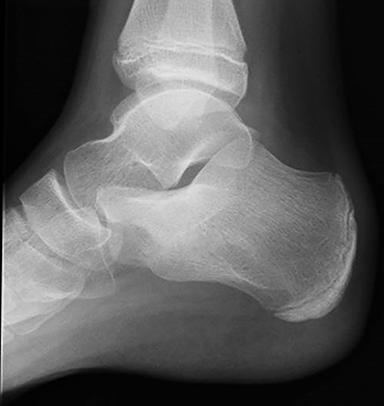 In retrospect, the X-rays demonstrated a subtle lytic focus in the superior and lateral aspect of the body of the calcaneus with sclerosis of the adjacent bone (Figures 1A,1B). 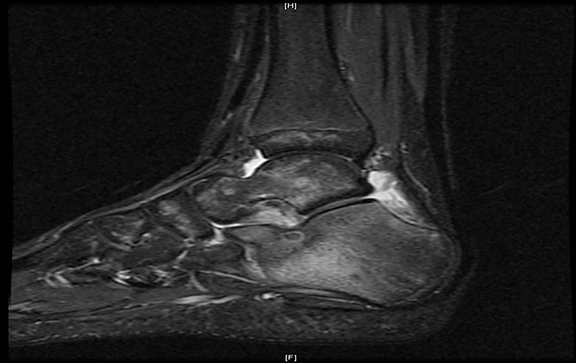 These findings, however, are very difficult to appreciate prospectively due to the complex shape of the calcaneus and overlapping bony structures. 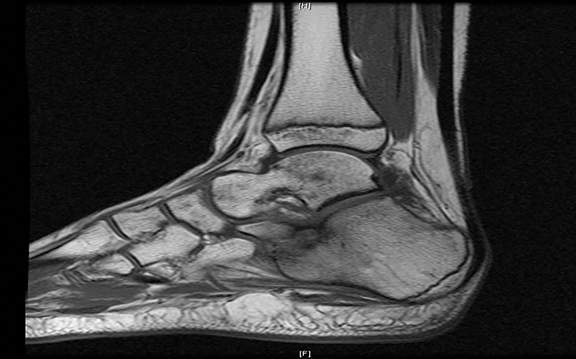 The MRI demonstrated a 5 mm, well-circumscribed lytic lesion in the superior and lateral aspect of the body of the calcaneus with severe adjacent marrow edema. Additional edema was noted in sinus tarsi, talus and lateral aspect of the distal tibia (Figures 2A, 2B, 2C). These findings were considered very suspicious for either an osteoid osteoma or bone abscess. 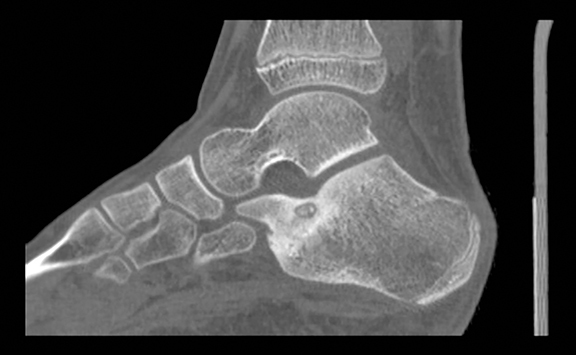 A follow-up CT exam demonstrated a well-circumscribed, 5 mm lytic lesion in the calcaneus with a central calcified nidus (Figures 3A,3B). There were sclerotic changes of the adjacent bone. This appearance on CT is classic for an osteoid osteoma. Osteoid osteoma is one of the more common benign bone lesions that classically presents in children and young adults (7-25 years) with nontraumatic pain that is worse in the evening and responds well to aspirin and other anti-inflammatory medications. There is often associated soft tissue swelling. The clinical presentation may be confusing and present similar to osteomyelitis. On radiographs, the classic osteoid osteoma is a well-circumscribed lytic lesion, with a central calcified nidus. Typically, there are sclerotic changes of the adjacent bone and cortical thickening, sometimes associated with a benign appearing periosteal reaction. Osteoid osteomas are most commonly distributed along the cortex of long bones and occasionally in the posterior elements of the spine. Rarely, these lesions involve the feet or hands. When osteoid osteomas appear in these locations, they tend to be intra-articular or juxta-articular and detection of the lesion on plain radiographs may be challenging related to the bone anatomy and overlapping structures. In many cases the diagnosis is delayed. 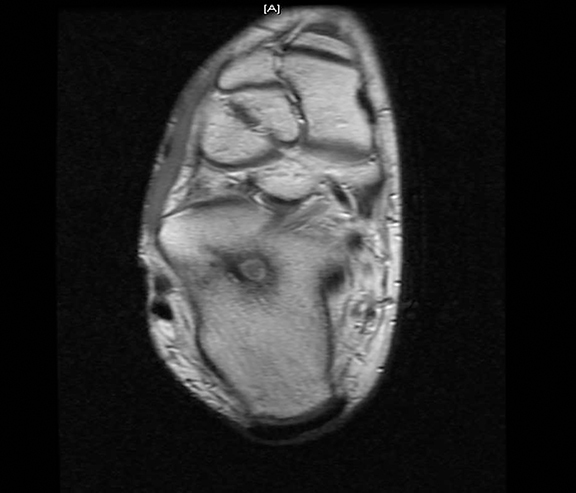 MRI is usually adequate in locating and characterizing osteoid osteomas as they often incite extensive bone marrow edema and inflammation as was present in this case. In addition, CT is often useful in making/confirming the diagnosis, particularly with regard to identifying the classic central calcified nidus, which may be difficult to identify on either the plain radiograph or MRI. Treatment options include medical therapy (NSAIDS and other anti-inflammatory medications), surgery, and percutaneous image guided options (eg, radiofrequency ablation, drill excision, ethanol injection, cryoablation and interstitial laser photocoagulation). CT guided radiofrequency (RF) ablation has proved to be a very effective, minimally invasive, and safe technique that can be used in the treatment of osteoid osteoma, and has emerged as the treatment of choice in symptomatic lesions. This patient was referred to a tertiary care facility that offered this service and she elected to have CT guided RF. The patient reportedly had nearly instant pain relief following the procedure and was completely asymptomatic within 2 weeks. Osteoid osteoma is a relatively common benign bone lesion in children and young adults that can present with nontraumatic bone pain. Depending upon the location of the lesion, it may be difficult to diagnosis. Initial X-rays may not be diagnostic of this lesion. Often, additional imaging modalities, including CT and or MRI, are helpful in confirming the diagnosis. RF ablation techniques offer a safe and effective treatment option for Osteoid osteoma. Resnick D. Tumor and Tumor-Like Lesions of Bone: Imaging and Pathology of Specific Bone Lesions. In: Diagnosis of bone and joint disorders 2nded. Philadelphia, PA: W.B. Saunders 1996: 991-998. Migues A, Velan O, Solari G,et al. 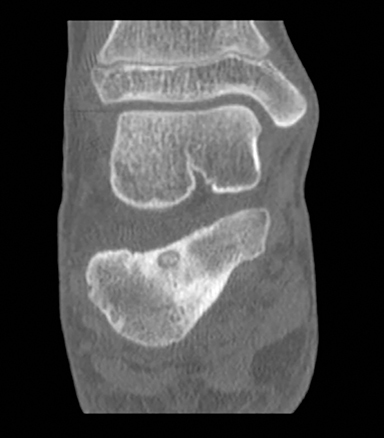 Osteoid osteoma of the calcaneus: Percutaneous radiofrequency ablation. J Foot Ankle Surg. 2005 Nov-Dec;44(6):469-472. Iyer RS, Chapman T, Chew FS. AJR Am J Roentgenol. 2012 May;198:1039-1052. Radiological Case: Osteoid osteoma. Appl Radiol. Prepared by Dr. Wasserman and Dr. Ernberg while serving as attending radiologists, and Dr. Culver while a third-year radiology resident (PGY-4), at Norwalk Hospital, Norwalk, CT.